This post was originally written as a sponsored post for Collective, Bias Inc. for its advertiser and has been edited since it’s original publish date. All opinions are mine alone. 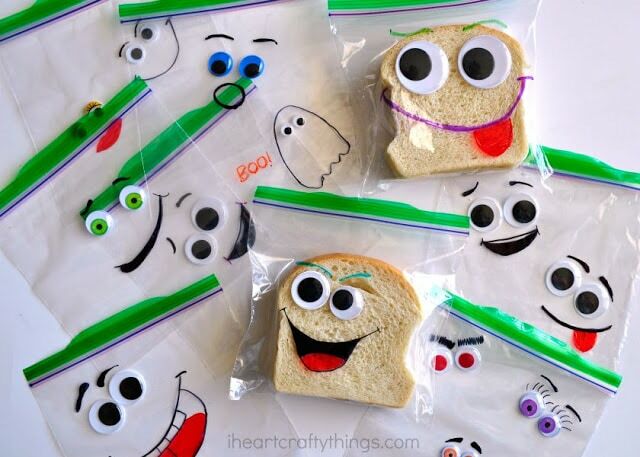 I hope you enjoy our DIY Back-to-School Silly Face Sandwich Bags and are excited to surprise your child with them in their school lunch. When my oldest son started first grade and took a lunch to school for the first time, I was super excited to pack his lunch on the first day of school. As most parents do, I left a special note in his lunchbox on his napkin that read “I love you xoxo.” I thought for sure it would brighten his day. Boy was I wrong! When he hopped into the car after school the first thing he said to me was, “Mom, why did you have to embarrass me with your note? !” Apparently, sentimental notes like that weren’t the ‘cool’ thing for boys. Whoops! In my haste, I knew I had to come up with a clever way to be a cool Mom that didn’t involve love notes. One morning while packing my son’s school lunch, an amazing idea hit me as I pulled out Ziploc® brand Sandwich bags. I realized I could bring a smile to my child’s face without using any words at all, and the next thing I knew these DIY Back to School Silly Face Sandwich Bags were born. Back-to-school time is an exciting time, but it can also make kids a bit nervous to have a new teacher, new classroom and new classmates. 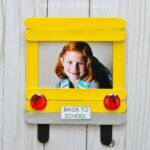 Now that I have two children, I am all too familiar with the first day of school jitters. 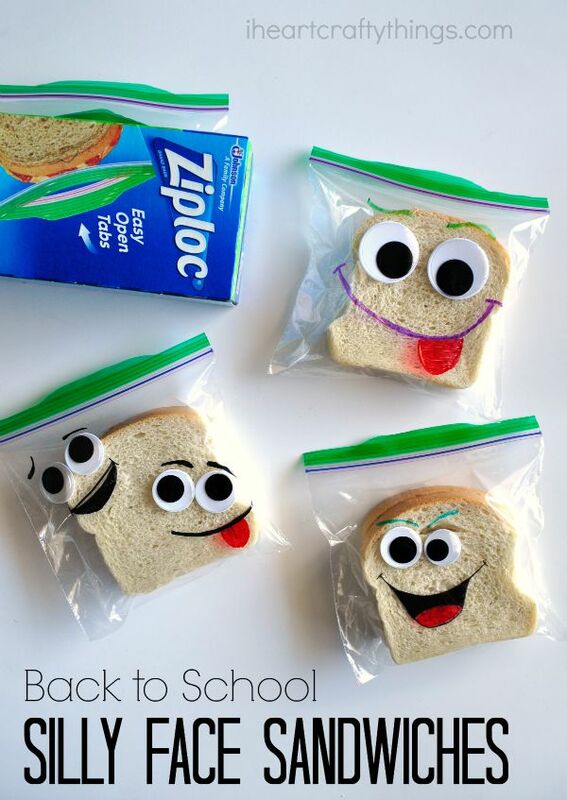 Putting one of these Silly Face Sandwich Bags in your child’s lunch is the perfect way to get them smiling and put their nerves at ease on the first day of school. 1. 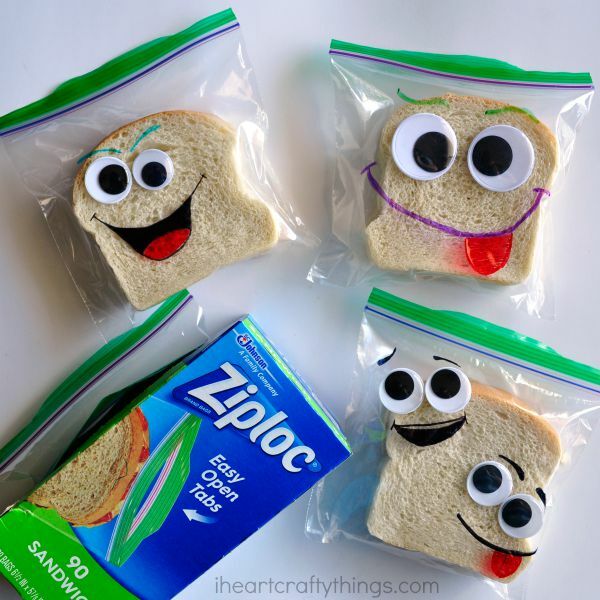 Start by putting some googly eyes onto your Ziploc® brand Sandwich bag using glue dots. Put one, two or more, however many you choose. Use all the same size, or make a silly face with different-sized googly eyes. 2. 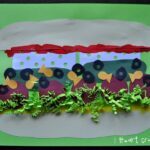 Now pull out your permanent markers and let your creativity take over by making goofy and silly features to your silly face. I try not to think too much about it and just let my creativity take over to see what I come up with. 3. When you are finished with one, make another and another. The more I make in one sitting, the more creative I feel like I get and the more fun I have. I love to sit and make them in batches, enough to last for several weeks. 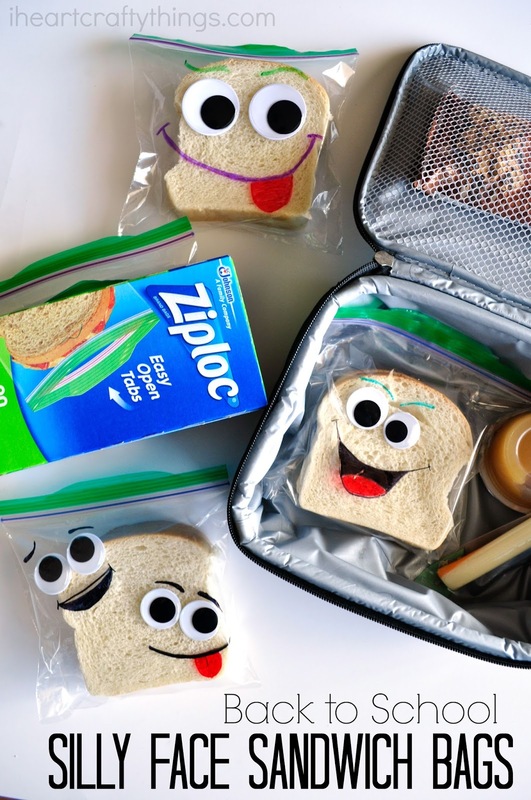 When I’m finished making them I stack them all together and place them in my kitchen drawer, where I store my Ziploc® brand bags, so they are ready to go when I pack lunches in the morning. By the way, I love the new Ziploc® brand bags with Easy Open Tabs! The added tab makes them easy to grip and to open, especially for kids. 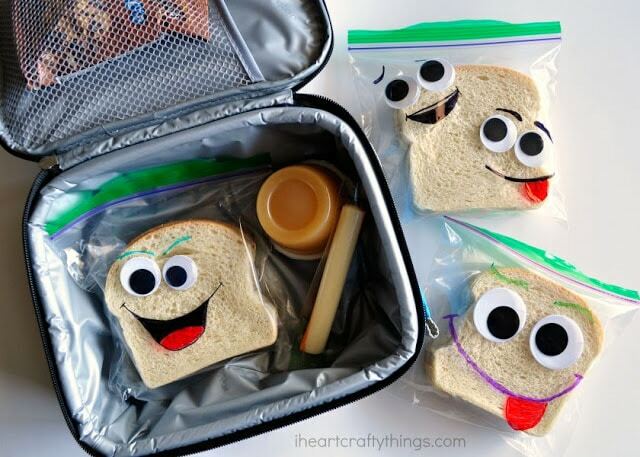 The best part of these silly face bags is the anticipation my kids have now when they open their lunch bag. Every silly face is unique and goofy in its own way, and my kids are so excited to see what face they get each day. In fact, it’s become a bit of a phenomenon among their classmates because they look forward to seeing the silly faces each day too. Do you have preschoolers still at home? Let them have some silly face sandwich bags fun too! Whenever I make some bags, my preschooler sits with me and makes some of her own bags. 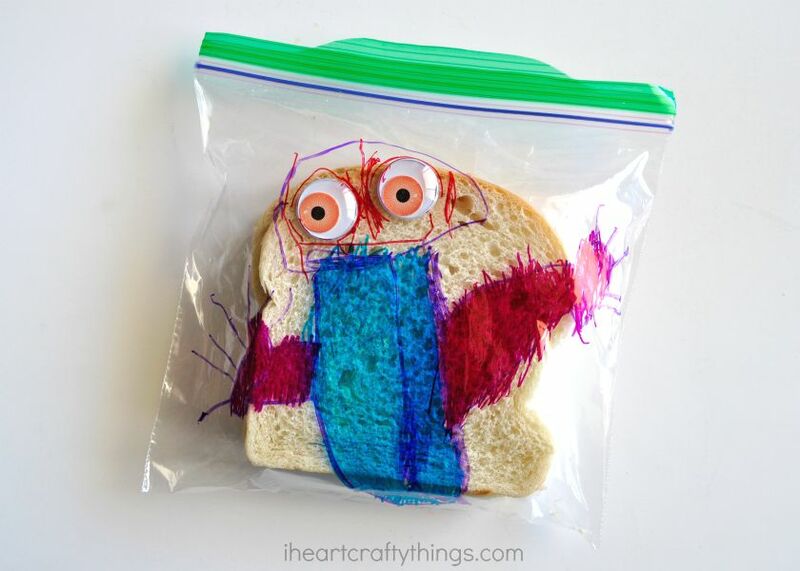 It’s a perfect arts and crafts activity, and her brothers love to get her special bags in their lunches too. Here’s a super cute one my daughter made pictured below. I’m going to let you in on another little secret of mine. I also use quart size Ziploc® brand Storage bags to store all my silly sandwich supplies together so they are easy to grab when I need to refill my silly sandwich bag stash. 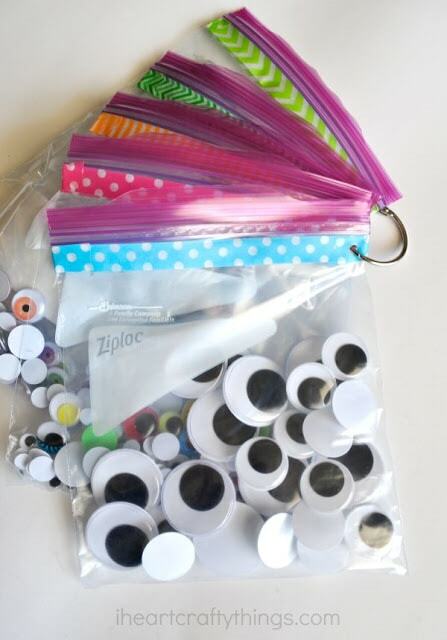 I divide my googly eyes into different bags based on their style and size, put my glue dots into a bag and put my permanent markers in another bag. Then I cover the top of each bag (under the seal) with washi tape on both sides as decoration and then hole-punching each bag. 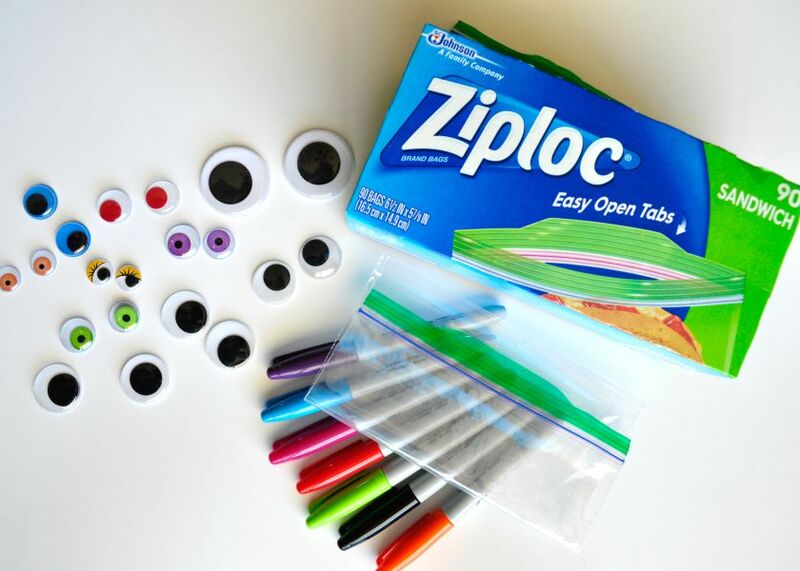 Connect all the Ziploc® brand bags together with a binder ring and store them in a convenient place. I have mine hanging on a hook in my craft closet so I can easily grab it when I need it. 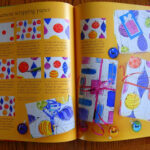 This a great way to store other craft supplies as well like beads, buttons, sequins, washi tape, etc. How do you get ready for back-to-school? I’d love to hear your ideas! I love these! We do holiday theme lunches for our kids, but these would make any day special!